As a practicing hypnotherapist, I am constantly seeing new clients, many of whom have never been hypnotized before. Often I’m asked, “Do you ever turn anyone away?” The answer to that is most definitely “yes.” In fact, I tell all prospective clients to try one session first before committing to a treatment series. That way, we can make sure we work well together so the client will get the most benefit from therapy. Of course, my next question was what had happened when he was six, and he told me he had been raped. Wow! That is a big deal, and it would certainly cause major issues, including those he was seeking help with. “I am not the slightest bit interested in talking about any of my past,” he went on to say. “I am a sales rep, but I am not reaching my goal numbers. All I want to talk about is the future—why I keep sabotaging my success, and why I can’t lose weight.” It was very apparent to me that the reason for his problems was related to what had happened to him at age six, and I mentally commended his previous hypnotherapist for bringing it up. However, I realized from his words that this person was not ready to look at what was almost certainly the root cause of LOTS of problems in his life besides his sales numbers…among other things, this likely included all his relationships. Unfortunately, I also knew he wasn’t my client because, as I told him, “I, too, would want to do some emotional clearing work on your childhood trauma, and I suggest working with a psychotherapist instead of just masking the symptoms of your root issue by getting affirmations from me to increase your sales success. You and I working together may not be a match.” Then I referred him to a good psychotherapist I know. Traumas cause scars, and their roots can be deep. When you do the much harder work of looking at those real issues, you heal problems you might not have even known existed. When I first tried hypnotherapy myself, it was to resolve my fear of dogs, which I thought had been caused by a dog bite incident when I was a kid. I went through the somewhat emotional process of remembering what had happened when I was bitten, in detail. It turned out I had forgotten part of it: while still bleeding from the bite, I had been slapped across the face and knocked to the ground by my dad because I had been told not to go near the dog and had disobeyed. I left that hypnotherapist’s office no longer scared of dogs, but later in the day something strange happened. My dad called, and I discovered that I didn’t have that anxious, fearful feeling in my stomach I usually experienced when I heard his voice. I hadn’t noticed I was afraid of my dad until those feelings were no longer there—only then could I see it! My mind had lumped my fear of dogs and fear of my dad together, so healing one healed the other. Since then, I have been able to create a happy, loving relationship with my father for the first time in my life, and this is a direct result of working on the ROOT of my fear of dogs rather than staying on the surface. One of my techniques is regressive hypnotherapy, which involves looking at the core causes of your issues to promote healing from the inside out. Sometimes, although not always, this kind of work can be emotional, as well as more difficult and time-intensive. It pays off, though, in infinitely more powerful healing than what is achieved through only addressing the apparent symptoms. This hugely more satisfying result is what I wish for all of you. 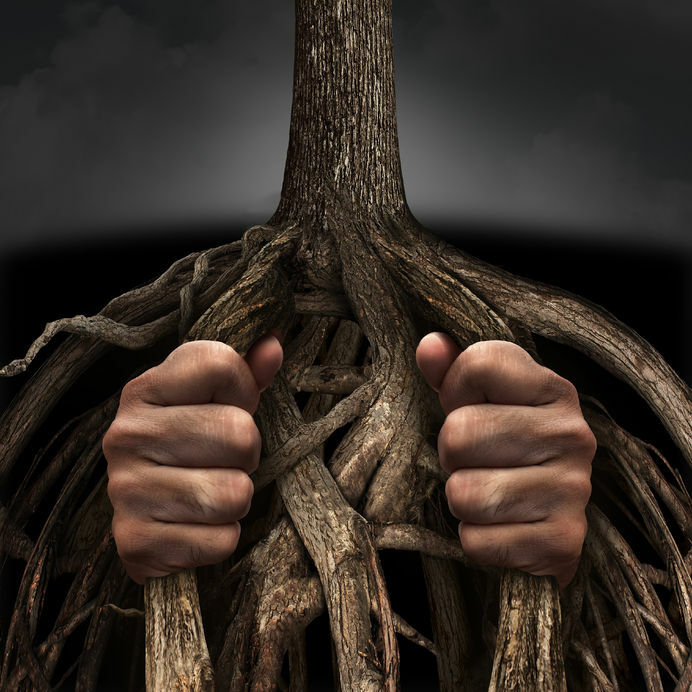 Once you’re willing to hack away at the root causes of your issues, you will be amazed at how many branches grew from it. This is the point where healing starts to feel like a true miracle, transforming you and your life. Knowing this, do you love yourself enough to uncover the deeper reasons for your pain, and start the amazing journey to your truest and healthiest self?